NEW! Updated game based on customer feedback. Now with more song, gem and witnessing scenario sapces. 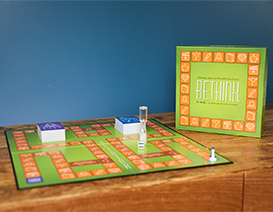 A fun board game for teams or a family. Participate in a variety of Bible based group activities that will test your memory and creativity. Activities include recalling where a scripture is located, what a scripture says and naming, drawing or acting out Bible characters. Song and witnessing scenario spaces provide additional fun challenges like acting out a scene in the ministry or recalling a song! Gem spaces allow the player to share something recently appreciated from a broadcast, meeting or during personal study. Simplified version instructions for 2-3 players are also included. A different game every time you play! 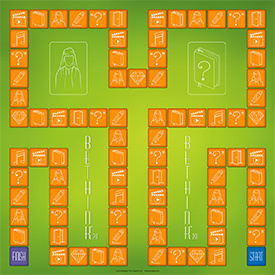 Includes 1 game board, 100 Bible Character Flash Cards, 100 Bible Scripture Flash Cards, 4 playing pieces, 1 sand timer and 1 die. Game board size: 18-1/4" x 18-1/4". 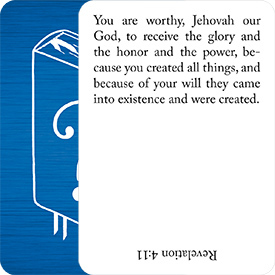 The included Bible Character Flash Cards consist of 100 characters and more than 850 scriptural references. 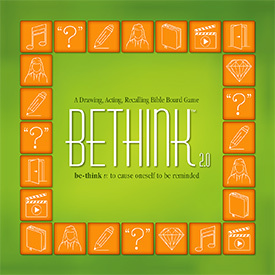 They are used in Bethink™ for naming, drawing and acting out Bible characters. These cards can also be used apart from the board game as a general memory aid. Card size: 2-1/2" x 3-1/2". 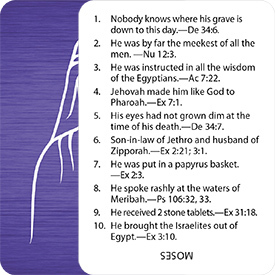 The included Bible Scripture Flash Cards consist of 100 scriptures and quotations from baptism questions and field ministry presentations. They are used in Bethink™ for remembering scripture quotations and citations. These cards can also be used apart from the board game as a general memory aid. Card size: 2-1/2" x 3-1/2".